Dom Pérignon was the first prestige cuvée Champagne introduced, an idea proposed by Englishman Laurence Venn. The first vintage of Dom Pérignon was 1921 and was only released for sale in 1936, sailing to New York in the liner Normandie. The brand, not exploited, was given by Champagne Mercier to Moët in 1927 for a wedding between the two families. In 1935, 300 bottles of a 1926-vintage precursor to Dom Pérignon were sold to Simon Bros. & Co., the company that imported Moët in the United Kingdom, who gave two bottles to each of their 150 best customers to commemorate their centenary. While these bottles were almost identical to the subsequent Dom Pérignon releases, they did not display the Dom Pérignon name, rather "Champagne specially shipped for Simon Brothers & Co's Centenary 1835-1935." 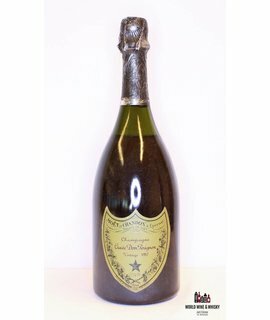 The wine got immediate attention in the marketplace and 100 boxes of the 1921 vintage were shipped to the United States shortly thereafter, this time displaying the Dom Pérignon name. James Buchanan Duke, the billionaire who had founded the American Tobacco Company, ordered 100 bottles for himself. The 17 bottles sold at an auction in Christie's in New York City in June 2004 were part of that order (Doris Duke, the billionaire’s daughter, had kept them in her cellar). According to current Dom Pérignon cellar master Richard Geoffroy (2012), who has been Chef de Cave for Dom Pérignon since 1990, the 1921 vintage had a "distinctive bouquet comprising sandalwood, vanilla and praline". Until the 1943 vintage, Dom Pérignon was produced from regular vintage Moët & Chandon Champagne that was transferred to the special 18th century-style bottles after extended cellaring. It was, thus, effectively an "oenothèque" release of Moët & Chandon Vintage Champagne in a different bottle. From the 1947 vintage, Dom Pérignon has been produced separately from the start. In 1971, the Shah of Iran ordered several bottles of the first vintage of Dom Pérignon Rosé (the 1959) for the 2,500 year celebration of the Persian Empire. A bottle of that champagne, from that order, was sold at auction for €24,758 in 2008. In 1981, Dom Pérignon was chosen for the wedding of Lady Diana Spencer and Prince Charles. The magnums of Dom Pérignon Vintage 1961 served on that July 29 carried a special insignia created just for the ceremony.